This is a delightful picture book written and illustrated by Caroline Magerl, published by Walker Books in 2018. 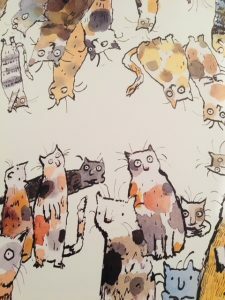 Even the cover and end papers are teeming with cats of all shapes and sizes. The first image we have of Maya, is of a wild child, sprinting through the streets, boa and pink pom poms trailing behind her, with a cat in her basket. 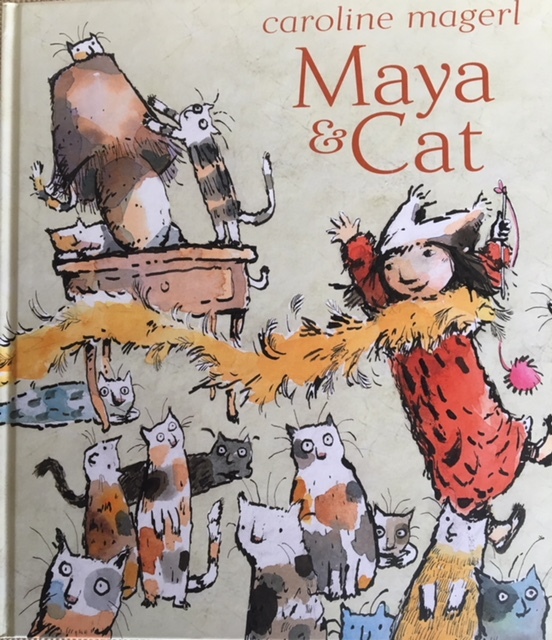 The language is a delight too, with perfect similes: ‘as wet as a seal, as grey as a puddle.’ The metaphor of the sea echoes though the text with expressions such as ‘the waves and folds of Maya’s blankets’ and onomatopoeia is used to great effect. The font is large with few words on each spread but there are double page spreads of wonderful drawings, of a crowded town and rickety houses and above a bleak stormy sky. In the background is just the hint of the sea. Maya tries to find the owner of the stray cat who is wrapped up ‘in a soggy tail’, but she has no luck. 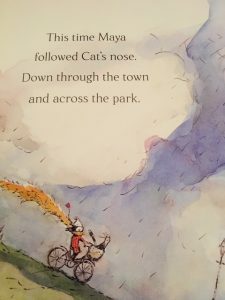 Then the cat solves the problem and leaps into Maya’s bicycle basket and this time, ‘Maya followed Cat’s nose.’ They come to the sea and the pier and there waiting are Fritz and Irma, beaming and calling from their houseboat. 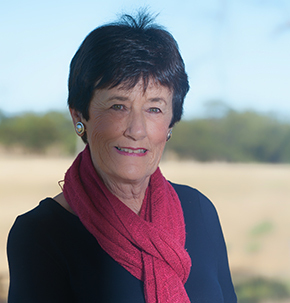 Caroline came to Australia from Germany at the age of two and spent 14 years sailing with her family on a yacht that became their home. So it is not hard to see the genesis of Fritz and Irma and seasick ship’s cats. 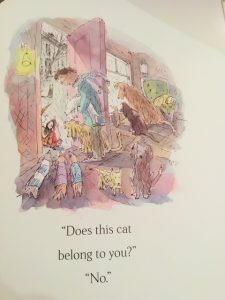 Cat lovers will be treated to a wonderful gem and children will love this affectionate story and be lost in the fine detail of all the images.